This pizza pasta bake is loaded with all of the classic pizza toppings and finished off with a layer of gooey mozzarella cheese. 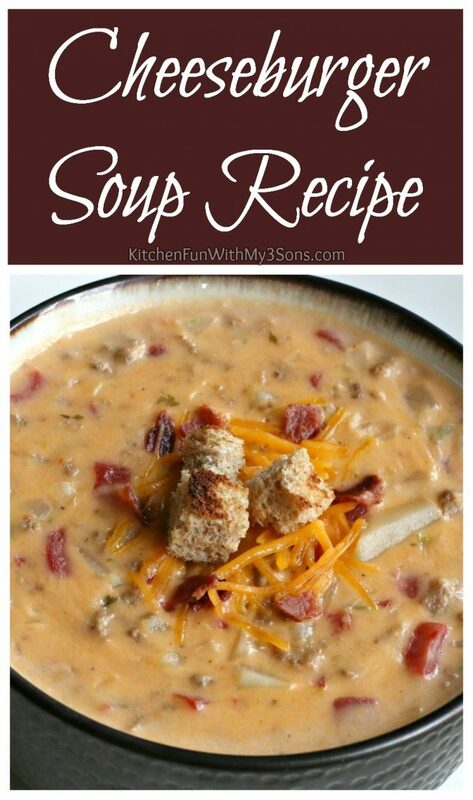 An easy dinner option that’s sure to be a hit with the whole family! There’s nothing more comforting or crowd pleasing than a cheesy baked pasta dish. 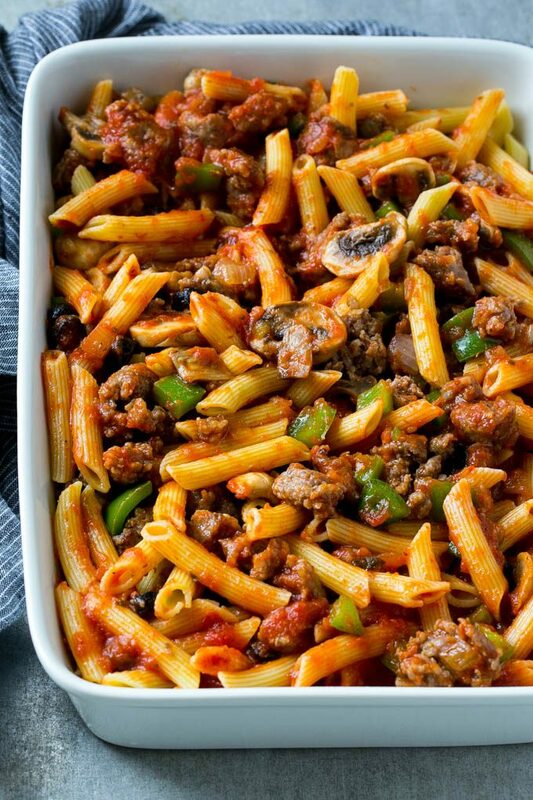 This pasta has all the great flavors of a supreme pizza, it’s full of onions, sausage, bell peppers, olives, mushrooms and pepperoni! 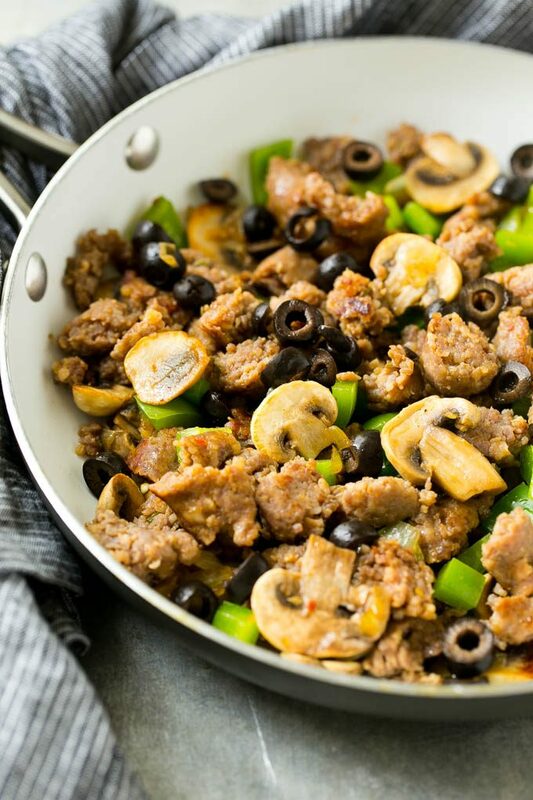 This recipe starts with the veggies and sausage. 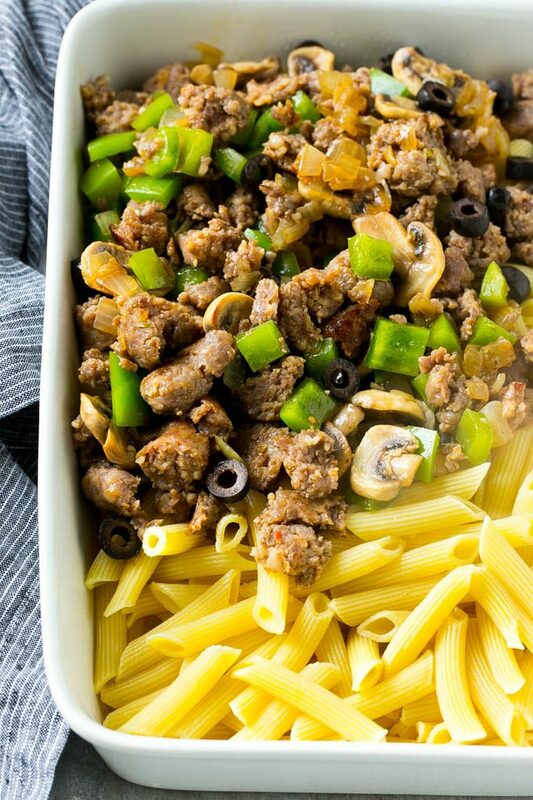 I typically make this recipe with mild Italian sausage, but if you like your pasta with a little kick, use the hot sausage variety. The peppers, onions, mushrooms and sausage all get cooked together until done. and then the marinara sauce. I use penne pasta here, but any short pasta will work, like rotini or rigatoni. I like to use a high quality store bought marinara sauce to save time, but you could make your own sauce if you prefer. The pasta mixture is topped with a layer of cheese and pepperoni, then baked to perfection. 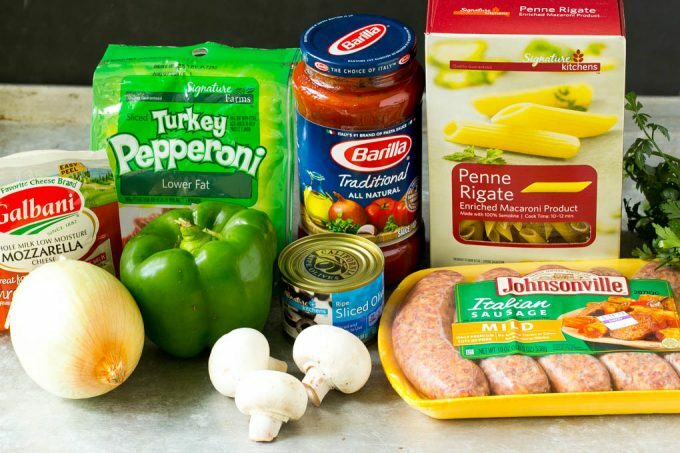 I typically use a turkey pepperoni, but you can use any variety that you prefer. 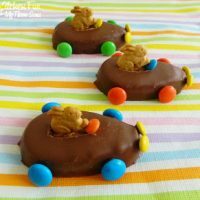 The great thing about this recipe is that it’s easy to switch up the ingredients to suit your family’s tastes. 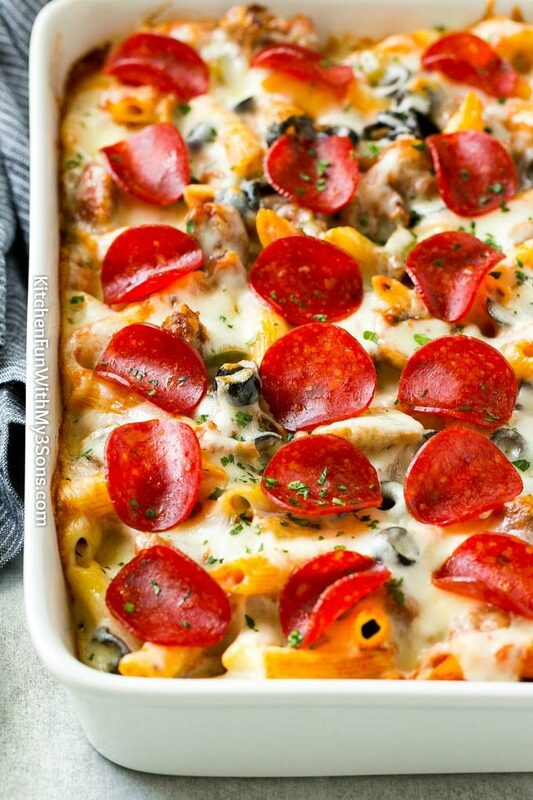 Sometimes I make this pasta bake as a meat lover’s pizza dish with sausage, pepperoni, ham and bacon. Other times when I’m in the mood for veggies I add in artichoke hearts, spinach, garlic and zucchini. The possibilities are endless! I add a little sprinkling of parsley on top for added color and freshness. This is an optional step, but adding fresh herbs to any meal always adds a little something extra. 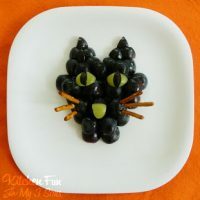 This dish can be prepared up to one day in advance and stored in the refrigerator until you’re ready to bake it. If you choose to make it in advance, add 20 extra minutes to the bake time so that everything is heated through. 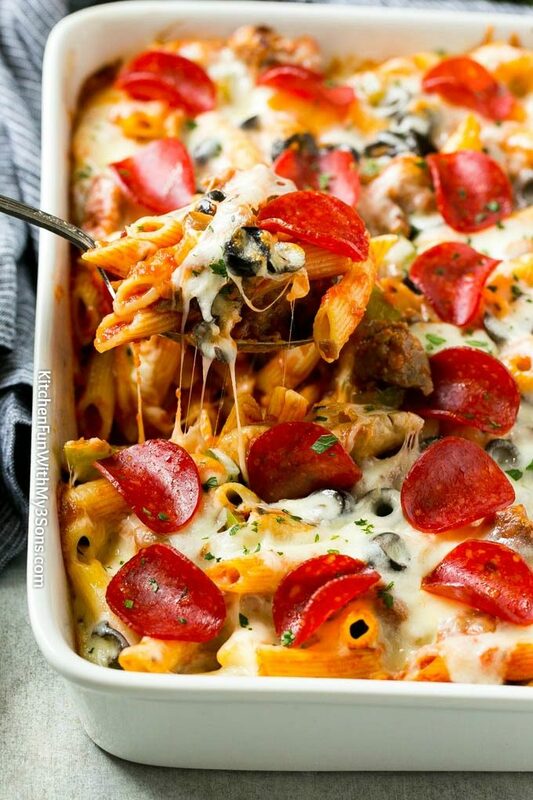 This pizza pasta bake is loaded with all of the classic pizza toppings and finished off with a layer of gooey mozzarella cheese. 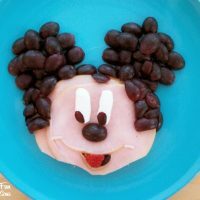 An easy dinner option that's sure to be a hit with the whole family! 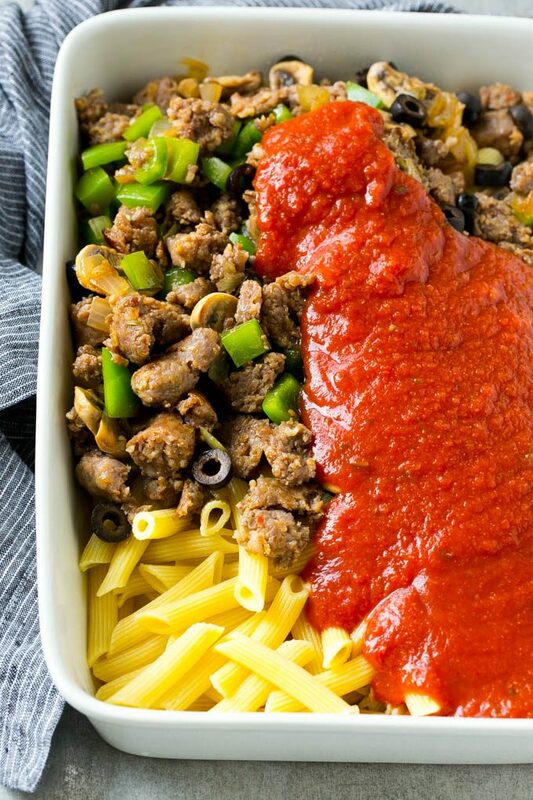 While the pasta cooks, prepare the meat and vegetable mixture. Add the onion, mushrooms and bell pepper to the pan. Cook for 4-5 minutes or until vegetables are just tender. Season the vegetables to taste with salt and pepper. Add the sausage to the pan. Cook, breaking apart with a spoon, until meat is cooked through, about 5-7 minutes. Stir the olives into the sausage mixture. Drain the penne pasta and pour it into a 9"x13" pan that's been coated with cooking spray. Add the sausage mixture and marinara sauce to the pan and toss gently to coat the pasta. Sprinkle the top of the pasta with the cheese and arrange pepperoni over the top. Bake for 20 minutes, or until cheese is melted and just starting to brown. 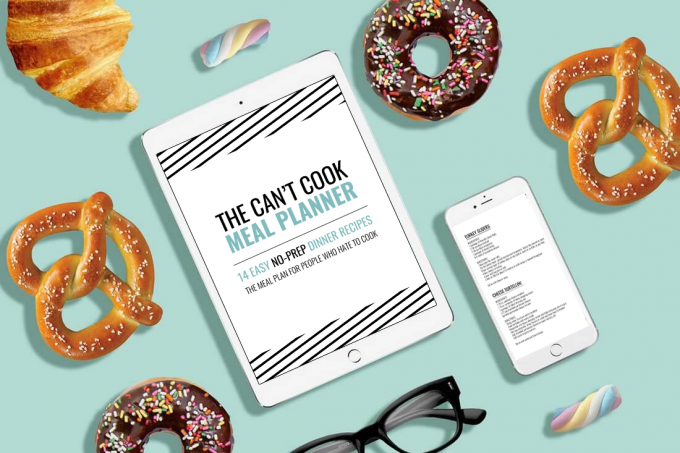 Check out The Can’t Cook Meal Planner – two full weeks of no-prep, easy meals!